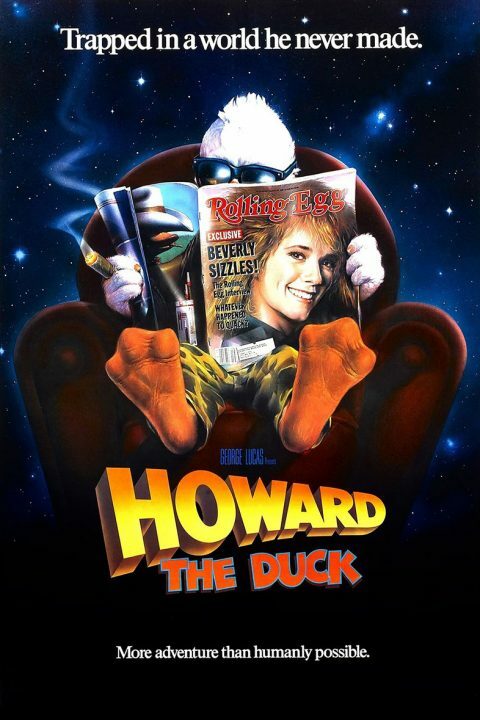 Howard the Duck, executive produced by George Lucas, is an offbeat, visual effects-filled comedy based on the cult favorite Marvel Comics series of the same name. It was written by Willard Huyck and Gloria Katz, the same husband-and-wife team who scripted American Graffiti (1973), Indiana Jones and the Temple of Doom (1984), and Radioland Murders (1994) for Lucasfilm. After an inter-dimensional portal is opened to Duck World, the cigar-chomping Howard is transported to Cleveland. The anthropomorphic waterfowl befriends local musician Beverly, faces the evil Dark Overlord, and eventually must choose whether to stay on Earth or return home.